The most common way to save extra money, is to match up a sale item and a manufacturer’s coupon. However, if you can find a STORE issued coupon and a manufacturer’s coupon that match-it’s even better. This is why County Market’s Penny Pinchers make us special to coupon users. Stores do not get lots of extra copies of the Penny Pincher booklets. Part of the contracts made with the vendors featured is that they issue all booklet by direct mail, and one per household. Likewise, your postal person is not allowed to hand you extra copies. However, we do trade may Penny Pincher coupons at our local club. Neighbors become GOOD neighbors when they share their unwanted pennies! When you use your Penny Pincher coupon, the deduction or price adjustment is scanned off of a store barcode. That will only happen for the number of items that the coupon allows. For example, if it says, Limit 2, but you buy 5, 2 will be discounted, the registers will automatically charge full price for the other 3 items. These coupon discounts are set PER TRANSACTION. I’m often asked about the usage of multiple Penny Pinchers. Yes, if you shop another day, with a duplicate Penny Pincher, it will clear to your purchase without any problems. We do have a place in our stores for swapping coupons. So if you find that you really want to shop twice and use a penny pincher offer again, it will clear. This is not a secret, many of you know this. Our members will trade Pennies among themselves. I often want extra kids foods, and other members want foods I do not plan to buy. We are allowed to trade them at club, or place extra coupons in our swap bins. The next step is finding a good Manufacturer’s match to the store coupon. Usually I find around 4 per month that make a good matches. . Be sure to take a look at our print N Save blog that comes out on Saturdays. I often put links to penny pincher printables in that section. Sometimes you’ll need to try a coupon and see if it works with the Penny Pincher offer. Often our penny pinchers will be an OPEN coupon offer. There is a big difference in using an open ended offer like, “Good on Johnsonville Meats” versus a closed offer like, “Good only on Johnsonville Chicken brats.” The County Market offer is for many Johnsonville types of sausages, including Chicken. By using both the MF Chicken offer, and the Store Open ended coupon, we stay correct and Legal. However, if the offers were reversed, and the County Market offer was Closed, and only for the Chicken Variety, and we had a Pork Italian sausage MF closed coupon, we would not match and the offer would not work. 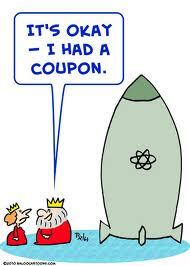 The hardest part of couponing, is figuring out what the coupon writer intended! If an offer is good on over 50 products, we will never know if it will work until we scan it. My personal advice is to try it and see. The worst case scenario is that you will be told, “Sorry this coupon does not apply to this product.” No harm in that. Penny Pinchers set us apart from other grocery stores. We offer more than just sales discounts each week, we offer true deep savings designed to allow a coupon user to really maximize your savings potential. Look for pennies every month in your mail.